Alysba Binat, an English literature teacher in an exclusive school, is 31 years old and very happily unmarried. Living in a small Pakistani town where, for women, marriage is the ultimate goal, her mother feels it is her life’s duty to ensure all five of her daughters are well-married, including Alysba. When an invitation to the wedding of the season arrives, Mrs. Pinkie Binat is overjoyed at the prospect of her daughters meeting so many men. Indeed, it does seem as if fate is smiling upon them as eldest, Jena, soon attracts the attention of Mr. Fahad “Bungles” Bingla, a most eligible bachelor. In the midst of all the flurry of activity that accompanies this wedding, Alysba meets Jeorgeullah Wickaam, a young lawyer in charge of a case for her father. Not only is Mr. Wickaam young, handsome, and successful, he is also the first cousin of Mr. Darsee, a friend of Bungles who has made a very bad first impression on Alysba. As Wickaam describes Mr. Darsee’s misconduct toward him, Alysba feels her initial impressions of Darsee’s attitudes of superiority and pride have been validated. Convinced she is right, she does nothing to check her growing disdain. After several social engagements, it is clear that Bungles is seriously considering a proposal of marriage to Jena. As the family waits anxiously for the proposal to come, Bungles is suddenly whisked away by his two sisters and Mr. Darsee. Alysba suspects some duplicity has occurred, courtesy of Darsee and the sisters, and when this is confirmed via information given to her by a good friend of Darsee she is even more disgusted with him. Unfortunately, Darsee has fallen for Alysba. When they are brought together again at his aunt’s estate in Lahore he is compelled to propose marriage to Alysba who, cognizant of the hurt he has caused her sister, rudely rejects him. When Darsee presses her for an explanation, Alysba not only offers the hurt he has brought upon Jena, but the way in which he swindled his first cousin, Mr. Wickaam. Before he walks out of her life forever, Mr. Darsee decides to send Alysba a letter of explanation—a letter to defend himself against the accusations Alysba has leveled against him. This letter, in which Mr. Darsee sees fit to tell Alysba some intimate secrets regarding the relationship between Mr. Wickaam and his family, is a turning point for Alysba. She realizes she has underestimated Mr. Darsee as a person because of a slight against her vanity, and that she has some personal conduct of her own to answer for. As the two move toward reconciliation and friendship, a family emergency almost derails their budding romance. But, with Mr. Darsee’s help, not to mention his money, things end well for the Binat family in general, and Mrs. Pinkie Binat in particular, who sees three of her five daughters married within a year. 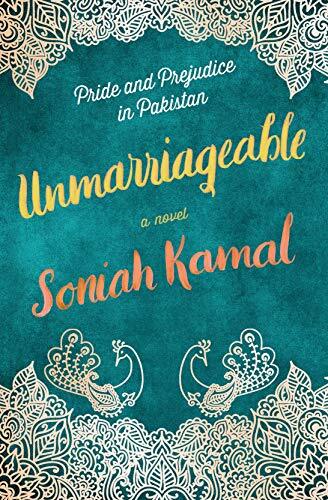 If all of this sounds a bit familiar it is because Soniah Kamal’s novel Unmarriageable is an homage to Jane Austen’s Pride and Prejudice. Indeed, if it is a truth universally acknowledged that a good story is timeless, then Soniah Kamal has proven just that. Moving the five Bennett sisters from Regency England to modern day Pakistan is done almost effortlessly. Author Kamal has given the five Bennett sisters rounded and complex personalities, and she creates likeable and understandable women. Friend, Sherry Loocluss who stands in for Charlotte Lucas is barren in a culture where having children determines a woman’s worth. Knowing this, her marriage to Alysba’s spurned suitor, Dr. Farhat Kaleen, is understandable and sympathetic. Even Mrs. Pinkie Binat comes across as far less ridiculous than her counterpart, Mrs. Bennett, as we see her deal with her husband’s inability to manage his household or children all the while grieving the wealth and prestige that she has lost. The five Binat sisters are given realistic desires, faults, and virtues and these are in sync with Kamal’s modern readers. While Soniah Kamal’s narrative is decidedly more spicy than anything Austen could have offered in her time, it is true to Austen’s voice and purpose. What she offers is an insightful and smart look at Pakistani culture and the ways in which women are viewed and how they view themselves. Like Austen, she seeks to shed light on the double standards and limitations that are set upon women by the societies in which they live. It is a witty delight that will leave you wishing for more. Cynthia A. Graham's most recent book is Between the Lies: A Novel (Blank Slate Press, 2018). Her novels have won 2015 and 2016 Midwest Book Awards for Mystery and a 2016 Independent Publisher's Gold Medal for Mystery/Cozy/Noir. Her historical novel Beulah's House of Prayer was a finalist for the Oklahoma Book Award.